Inquiring About a Heating Company in Big Lake? There are lots of reasons to take advantage of a heating company. The HVAC techs from DeZiel Heating & A/C/ can install a furnace in your home or business. Call our HVAC Contractor today at 763-684-3965 or 612-719-0764 and schedule your next installation. Your heating system cannot operate adequately if it isn’t working right. There are too many things that can go wrong with it. 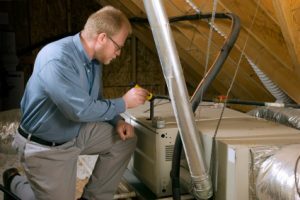 Problems such as blower issues can make the difference between a really good working furnace or a poorly functioning one. Repairs are all based on the type of unit that you have installed. There are several types of heaters as each one works differently. You can always count on DeZiel Heating & Air Conditioning for up to date repairs on your system. Furnace – A furnace is one of the most common types of heating systems. They function by blowing heated air through a duct system. Boiler – Sometimes referred to as radiant heat, this type of system heats water through gas or electric, then blows warm air out through steam. Heat Pump – This heating system absorbs heat through outside sources such as the air or water. It then uses a heat exchanger to transfer it inside. An air conditioner can come in the following forms: packaged, central and split. Each type basically works the same way, but placed in various types housings. When they stop working, life can get pretty miserable. The benefits of a packaged AC system offer easy accessibility. When you hire DeZiel Heating & Air Conditioning, we can get into this type of system as it is comprised of two parts: the indoor and the outdoor system. The central system offers quiet noise levels when running properly. This is mainly due to the system being on the outside of the house. For reduced noise levels, call the professionals who can get repairs done that same day. A heat pump can stop blowing out warm air very easily. This normally happens after normal hours of operation. When our business day ends, your heating problems just begin. You don’t have to worry about those late night repairs. We are always available to work on your heat pump as we’re the heating company who can take a professional look at you system and diagnose it for repair. Don’t let your heating system dictate how warm you’re going to be. All you have to do is connect with our HVAC techs. If you are looking for a Big Lake Heating & Cooling Expert then please call 763-684-3965 or complete our online request form.